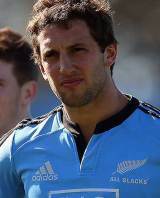 If ever there was a player upon birth who was tipped for greatness, it is All Blacks fly-half Tom Taylor. The son of Warwick, who played for the All Blacks from 1983 to 1988, and the nephew of Murray, who won seven caps for the Kiwis, Taylor has followed in his relatives footsteps and opted to line-up at half-back. Taylor made his debut for Canterbury in 2011 but by that time he had already lined up in the New Zealand U20 side alongside All Blacks Zac Guildford and Aaron Cruden. His impressive performances saw him called into the Crusaders squad for the 2012 campaign where he alternated between inside centre and No.10. Come 2013, he established himself as the Crusaders' first choice No.12 and at times took over the kicking duties from Dan Carter. Injuries to New Zealand's fly-halves saw him propelled into the Test reckoning for the second match of the 2013 Rugby Championship where he helped the Kiwis to a win over trans-Tasman rivals Australia.